What do you imagine when the word “ecotourism” comes to mind? I know I usually daydream about a trip my husband I took to Costa Rica several years ago, surrounded by lush tropical rainforests as we ziplined through the canopy. I might also think about visiting a National Park, following a neatly maintained trail and stopping at signs placed at just the right spot so visitors can read and understand the special features of the place. Ecotourism, done right, brings a visitor to a unique place, tells its story, and immerses the visitor in the sights and sounds in a way that treads lightly on the location. I always know I’ve been on a good ecotour when I’m tired, happy, and have learned or seen something new. A colleague with The Conservation Fund has stated that sustainable tourism includes: “Authentic experiences that are unique and specialized to the place (its culture, heritage, and natural resources), emphasizes quality over quantity, focuses on distinctive destinations, unspoiled landscapes, and historic buildings, and differs from mass-market tourism by favoring locally-owned businesses, thereby increasing circulation of money in the local economy.” The truly wonderful thing about ecotourism is that local touch; it exists solely because of the place, so it cannot be outsourced. The best storytellers about those places are usually the people who have lived there for many years, so by its very nature, ecotourism provides jobs for local residents. 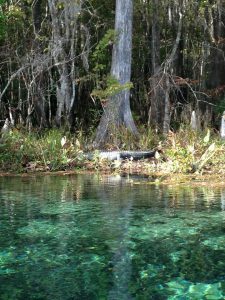 Northwest Florida has hundreds of unique locations for visitors and locals to explore…we have centuries-old forts, clear-blue springs, endless rivers and creeks to paddle, trails on the coast and up our modest hills. We have caves and underground caverns, waterfalls, pitcher plant prairies, fishing, wildlife watching, and reefs for snorkeling and SCUBA diving. While millions come here for our quartz-sand beaches, other options that highlight our natural ecosystems deserve more attention and notoriety. A few years ago, several Extension Agents received funding for a project called Naturally EscaRosa. The idea behind that project was to help promote and create businesses that sustainably used our agricultural and natural resources. The website (www.naturallyescarosa.com) has a list of over 100 businesses and locations where locals and out-of-town visitors can explore the less well-traveled areas of Escambia and Santa Rosa County. As you move east down the coast, Walton Outdoors, the local Visit Florida affiliates, and other privately managed media groups have done similar work, providing a showcase for these treasures in our midst. This summer, try one of the local ecotourism or agritourism venues near you! Moreover, when your friends and family visit from out of town, encourage them to do the same. We cannot have a successful economy without a healthy ecosystem, and supporting these local and regional businesses is good for both. For more information on sustainable ecotourism, visit the Society for Ethical Ecotourism (SEE), and for information on starting or visiting an agritourism business, try Visit Florida Farms. And as always, reach out to your local County Extension agents, and we will be more than happy to point you in the right direction to discover to places to explore with your family.